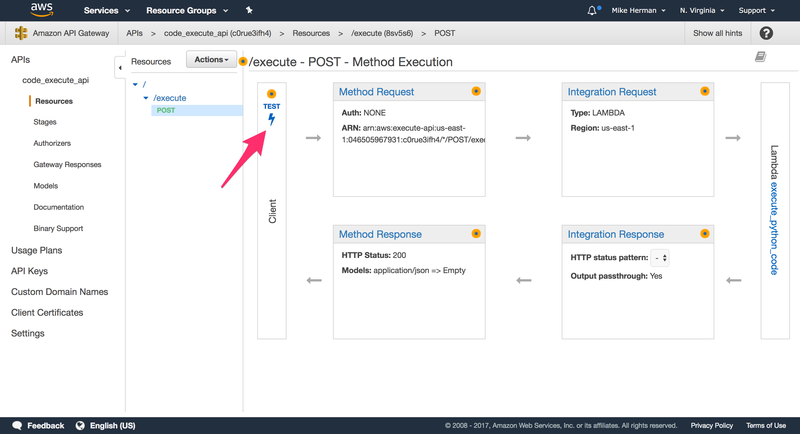 This tutorial details how AWS Lambda and API Gateway can be used to develop a simple code evaluation API, where an end user submits code, via an AJAX form submission, which is then executed securely by a Lambda function. Check out the live demo of what you’ll be building in action here. WARNING: The code found in this tutorial is used to build a toy app to prototype a proof of concept and is not meant for production use. 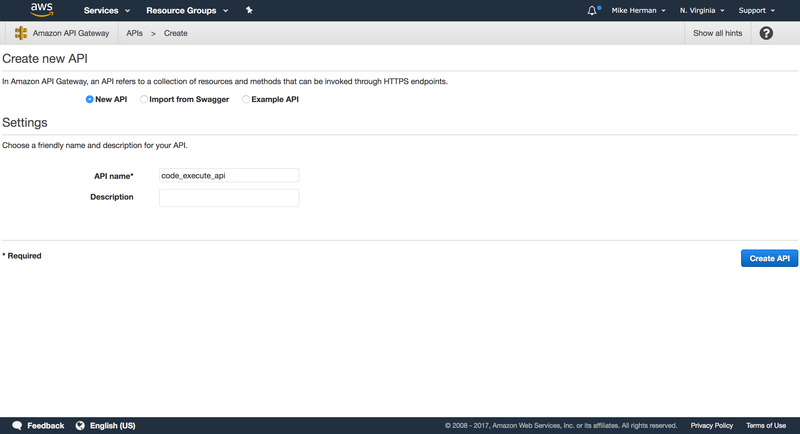 This tutorial assumes that you already have an account set up with AWS. Also, we will use the US East (N. Virginia) / us-east-1 region. Feel free to use the region of your choice. For more info, review the Regions and Availability Zones guide. 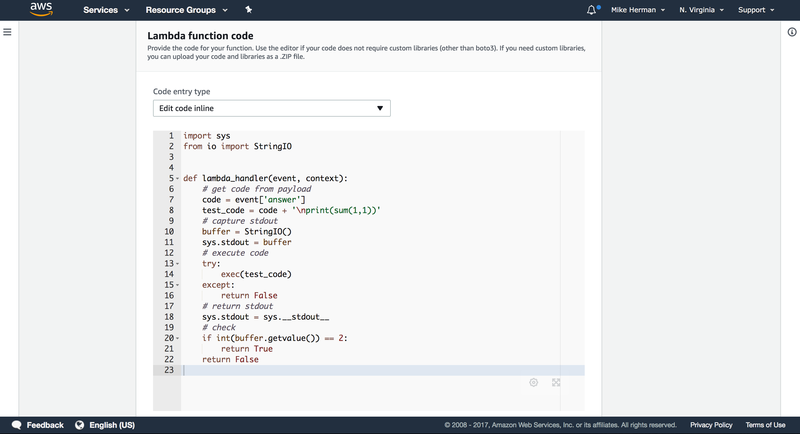 Amazon Web Services (AWS) Lambda is an on-demand compute service that lets you run code in response to events or HTTP requests. 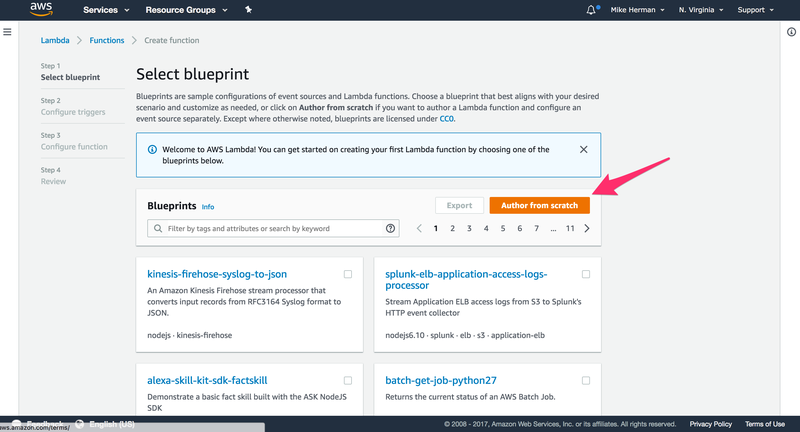 For more examples, review the Examples of How to Use AWS Lambda guide from AWS. 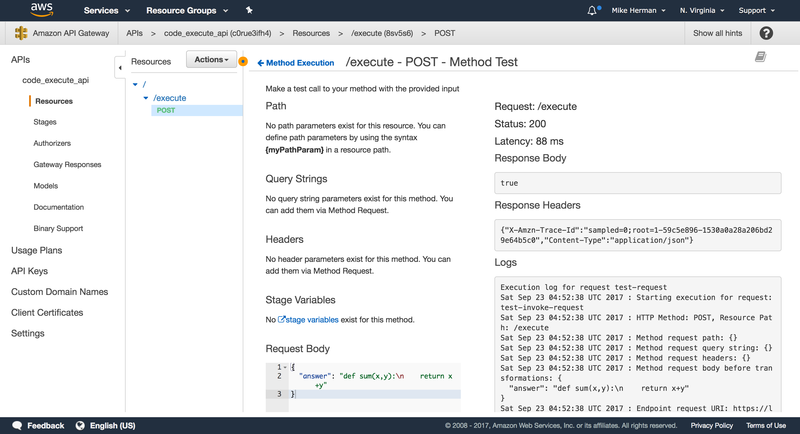 You can run scripts and apps without having to provision or manage servers in a seemingly infinitely-scalable environment where you pay only for usage. This is “serverless” computing in a nut shell. 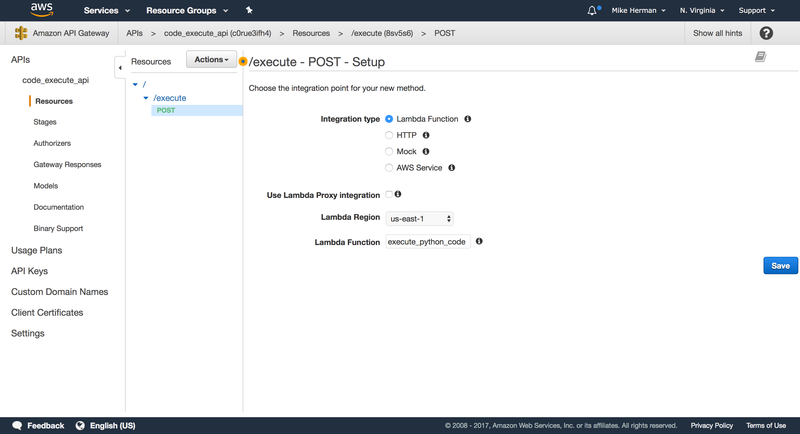 For our purposes, AWS Lambda is a perfect solution for running user-supplied code quickly, securely, and cheaply. Let’s quickly review the code. Essentially, we just have a simple HTML form styled with Bootstrap. The input field is replaced with Ace, an embeddable code editor, which provides basic syntax highlighting. Finally, within assets/main.js, a jQuery event handler is wired up to grab the code from the Ace editor, when the form is submitted, and send the data somewhere (eventually to API Gateway) via an AJAX request. 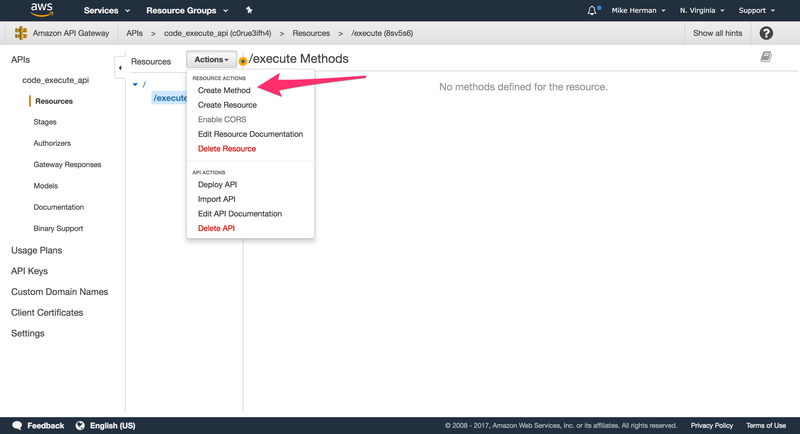 Configure Triggers: We’ll set up the API Gateway integration later, so simply click “Next” to skip this part. 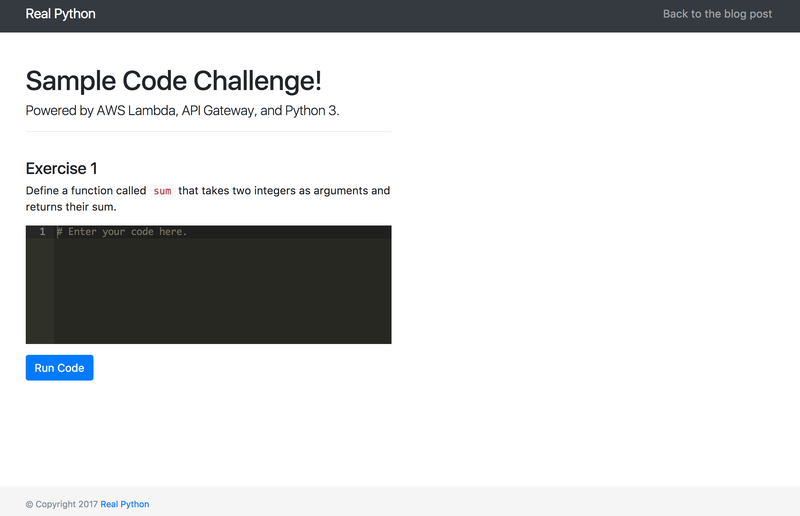 Configure function: Name the function execute_python_code, and add a basic description - Execute user-supplied Python code. Select “Python 3.6” in the “Runtime” drop-down. 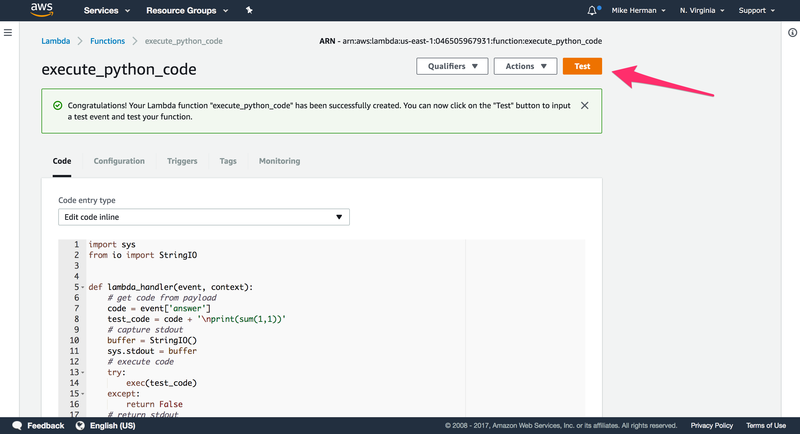 Here, within lambda_handler, which is the default entry point for Lambda, we parse the JSON request body, passing the supplied code along with some test code - sum(1,1) - to the exec function - which executes the string as Python code. Then, we simply ensure the actual results are the same as what’s expected - e.g., 2 - and return the appropriate response. 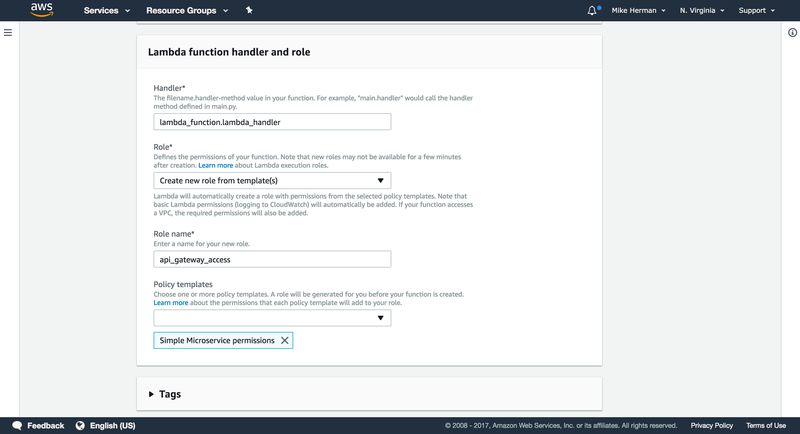 Under “Lambda function handler and role”, leave the default handler and then select “Create a new Role from template(s)” from the drop-down. 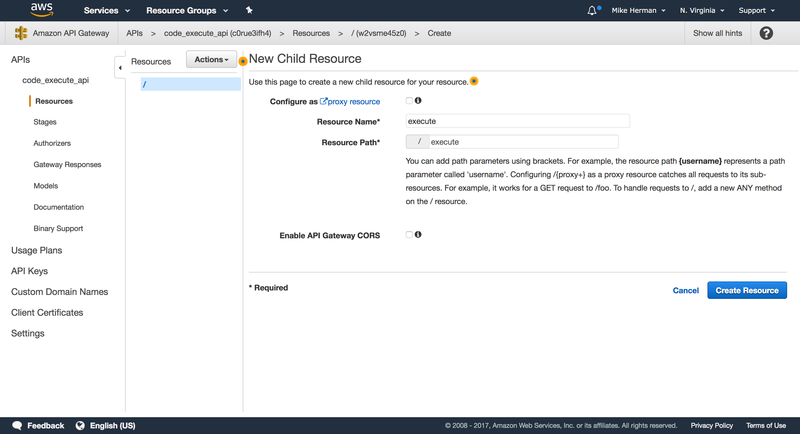 Enter a “Role name”, like api_gateway_access, and select ” Simple Microservice permissions” for the “Policy templates”, which provides access to API Gateway. 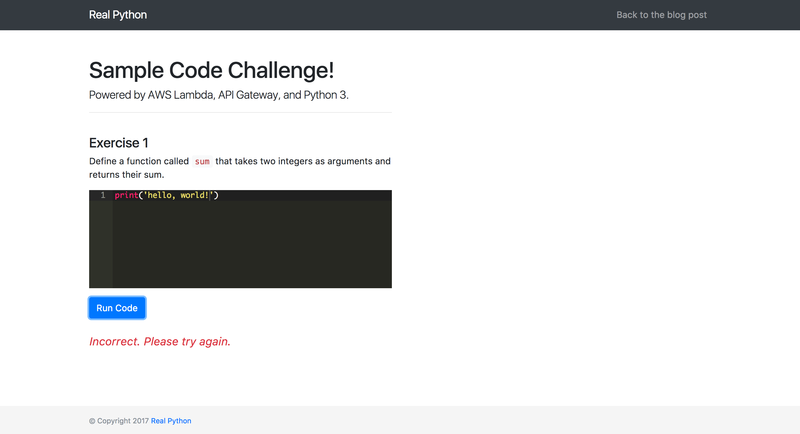 Review: Create the function after a quick review. 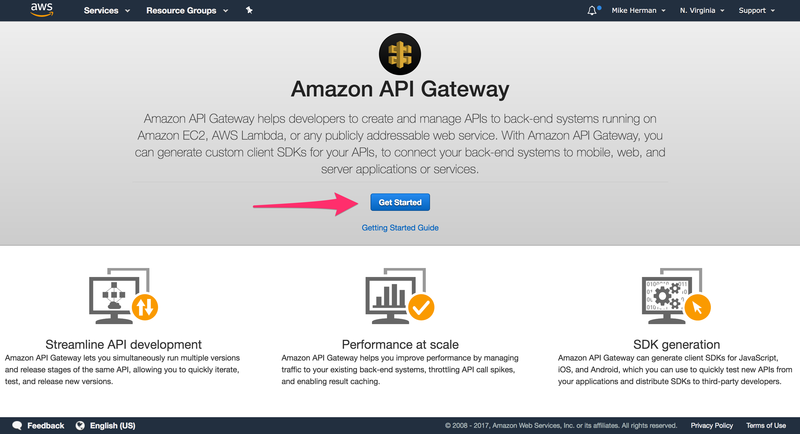 "answer": "def sum(x,y):\n    return x+y"
API Gateway is used to define and host APIs. 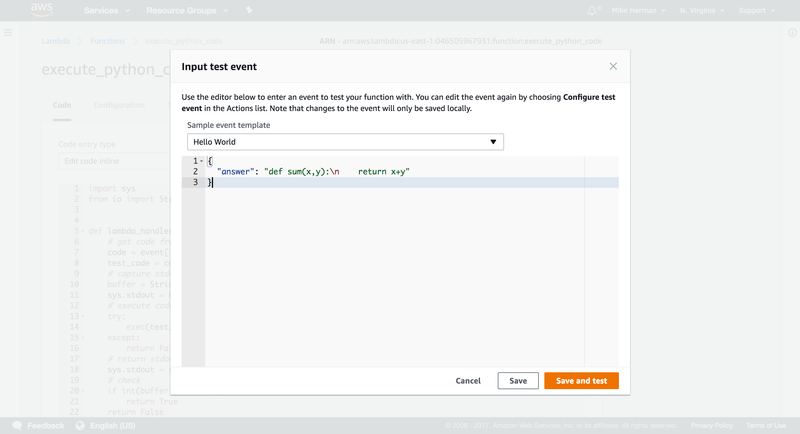 In our example, we’ll create a single HTTP POST endpoint that triggers the Lambda function when an HTTP request is received and then responds with the results of the Lambda function, either true or false. Select “Create Resource” from the “Actions” drop-down. 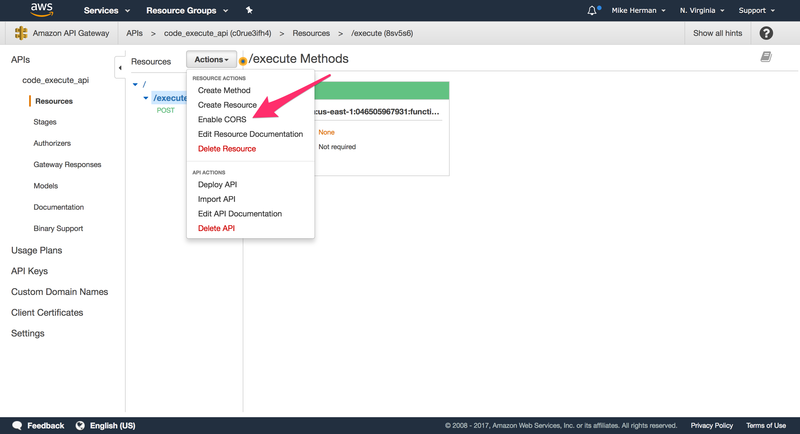 Name the resource execute, and then click “Create Resource”. 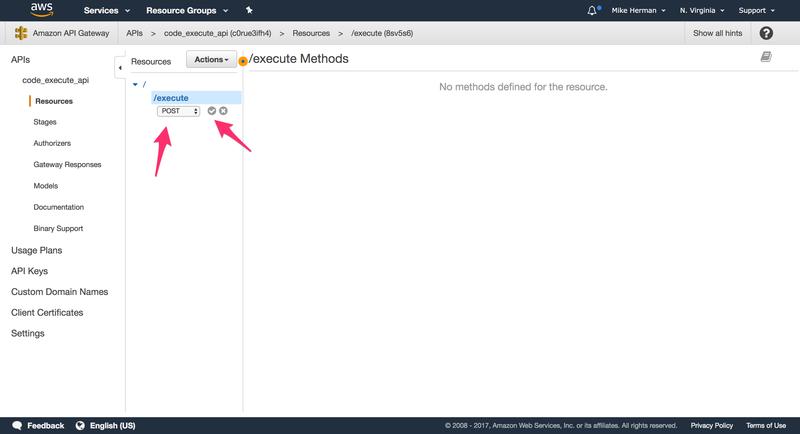 With the resource highlighted, select “Create Method” from the “Actions” drop-down. 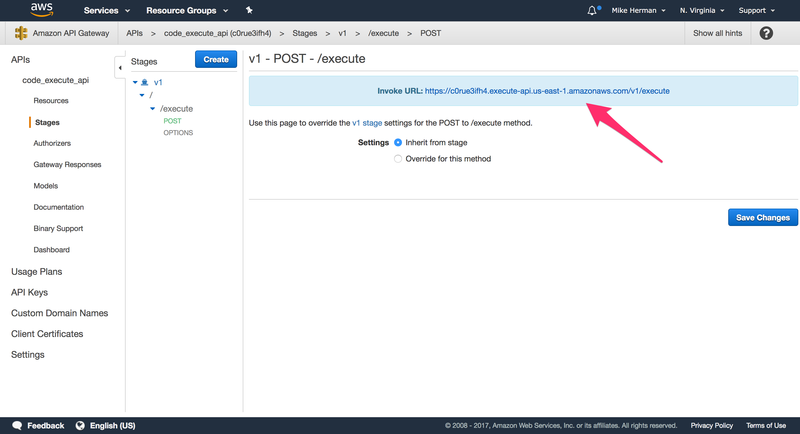 Choose “POST” from the method drop-down. Click the checkmark next to it. 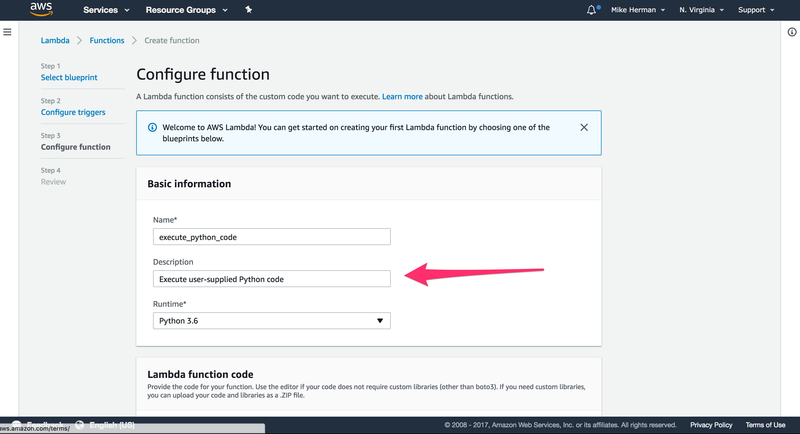 In the “Setup” step, select “Lambda Function” as the “Integration type”, select the “us-east-1” region in the drop-down, and enter the name of the Lambda function that you just created. 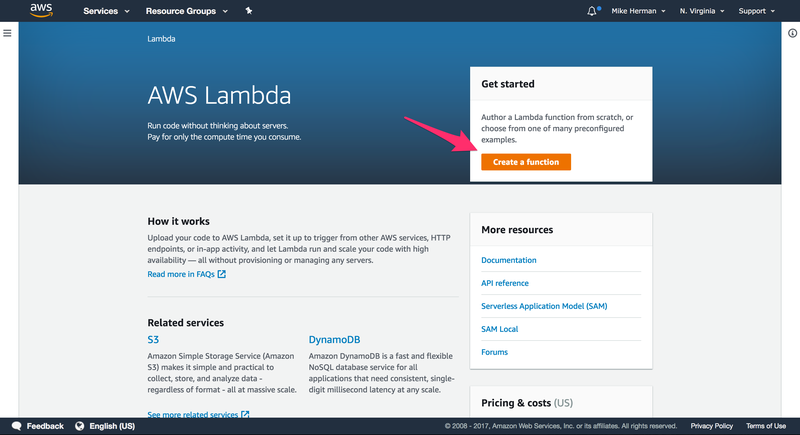 Click “Save”, and then click “OK” to give permission to the API Gateway to run your Lambda function. To test, click on the lightning bolt that says “Test”. 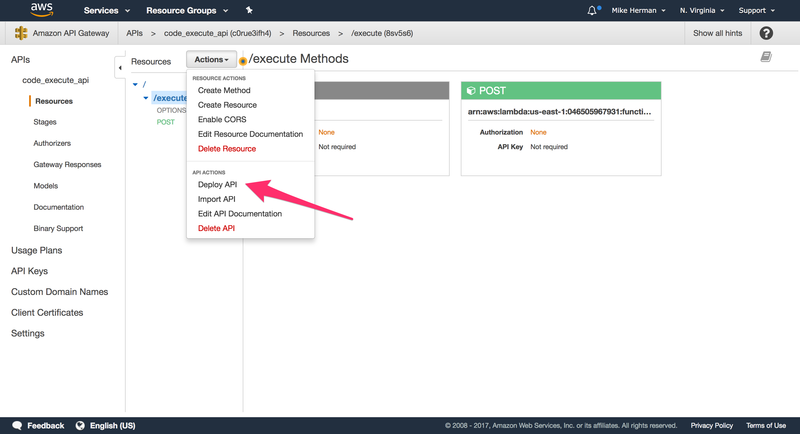 Next, we need to enable CORS so that we can POST to the API endpoint from another domain. Just keep the defaults for now since we’re still testing the API. 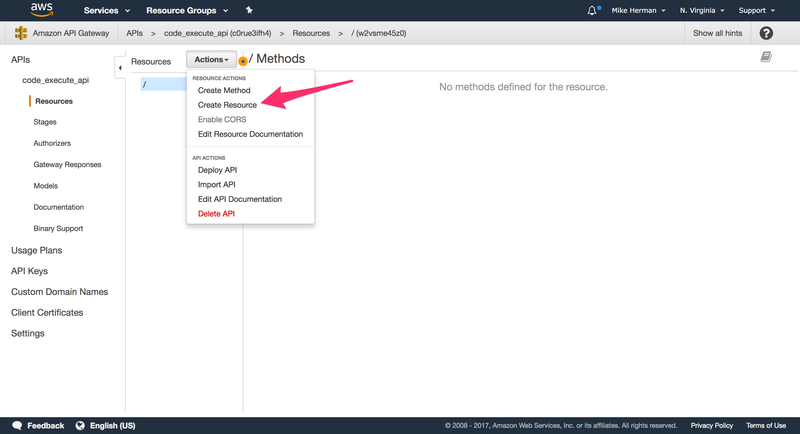 Click the “Enable CORS and replace existing CORS headers” button. Production: Think about what’s required for a more robust, production-ready application - HTTPS, authentication, possibly a data store. 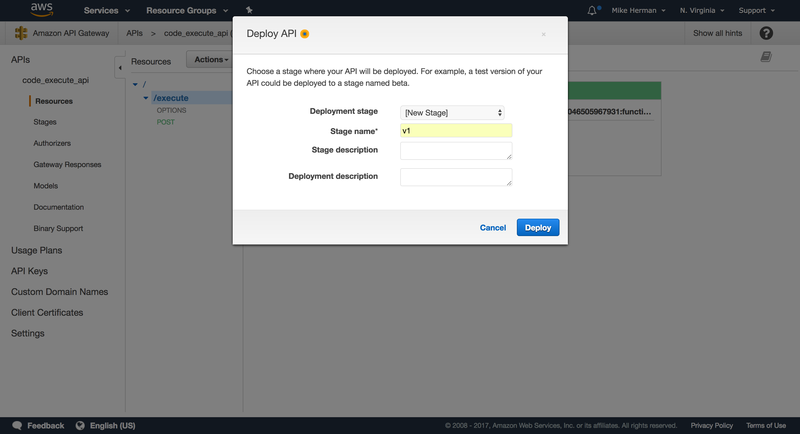 How would you implement these within AWS? Which AWS services can/would you use? Dynamic: Right now the Lambda function can only be used to test the sum function. How could you make this (more) dynamic, so that it can be used to test any code challenge (maybe even in any language)? Try adding a data attribute to the DOM, so that when a user submits an exercise the test code along with solution is sent along with the POST request - i.e., <some-html-element data-test="\nprint(sum(1,1))" data-results"2" </some-html-element>. Stack trace: Instead of just responding with true or false, send back the entire stack trace and add it to the DOM when the answer is incorrect. Thanks for reading. Add questions and/or comments below. 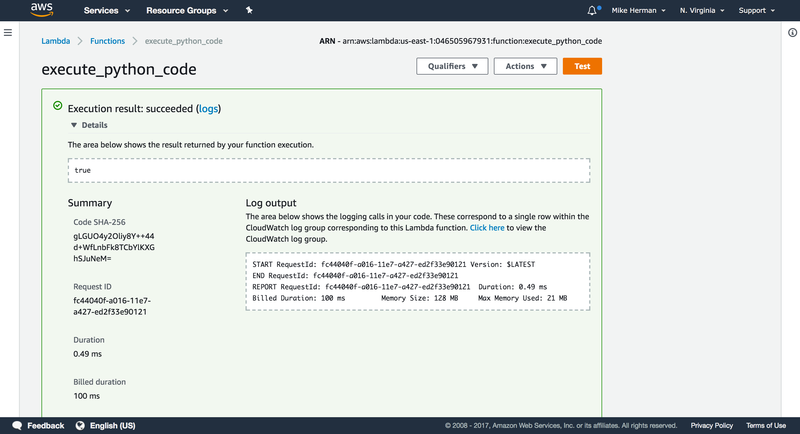 Grab the final code from the aws-lambda-code-execute repo. Cheers!